First, I would like to thank you so much for your prayers, phone calls, and messages from around the world that you have sent in the last few days. I want you to know that these meant a lot to me personally and to your brothers and sisters in the church here. In the midst of the turmoil which Egypt is going through, we have felt that the Lord is very near to us. We have experienced his peace, and we were assured of his protection. In most of our churches and homes, there have been prayer meetings for the situation and for our beloved country Egypt. All our churches are safe, although they have not been guarded by the security since Friday when all the security were withdrawn. This assured us that the one who protects the churches is the Lord of the Church. I was touched to see young adults, Muslims and Christians, guarding the streets, homes, and our churches. They did not allow any thieves or looters to come near the area. They also arrested some of those and handed them over to the Army. I applaud our local Egyptian clergy and people who joined the youth in the streets in guarding homes and churches. I admired all our expatriate clergy and diocesan staff who refused to leave Egypt in order to stay in the midst of the people who decided not to go, even when their Embassies encouraged them to leave and provided airplanes to do so. Yesterday demonstrations were very peaceful, in spite of the huge number that gathered in the middle of Cairo. We praise the Lord that we have now the internet back, and we can communicate with you all. This morning the security also returned to guard the churches as normal. Yesterday, President Mubarak made it very clear that he will not seek re-election after he finishes his term in November 2011. He appointed Mr. Ibrahim Soliman as a Vice-President. He has a good reputation among Egyptians. This appointment ruled out the possibility of appointing the President's son as a successor. President Mubarak also appointed a new Prime Minister, Mr. Shafik who was the Minister of Civil Aviation (Egypt Air, etc…). He is a very good man and has done a lot of improvement in his previous Ministry. President Mubarak also called for a review for the Constitution to allow democracy; he also assured the people that those who were responsible for the violence, destructions, looting, escape of prisoners, etc… will be brought to judgment. Our concern was that extremist groups would take advantage of the demonstrations to push for violence. We thank God that this did not happen. It seems that the majority of the youth who are demonstrating are aware of this possibility. Many of them started to see this possible risk. The youth who were interviewed by the television yesterday mentioned that all what they need is democracy. Many groups this morning are demonstrating in support of President Mubarak, the new government, and peaceful transfer of authority at the end of the Presidents term. Egypt is a very important country in the whole of the Middle East, and whatever happens in Egypt affects the rest of the countries. I was amazed at how the President of Yemen, this morning, announced that he will not seek re-election and will not promote his son to be the next president. We pray that we can set a good example to the surrounding countries. Our churches and institutions, so that we can fix our eyes on God who is in control. May what is happening help us to draw nearer to God and to know that the time is short. The end of demonstrations, especially in view of the changes that President Mubarak announced. This will bring Egypt back to normal and the curfew will be ended. The new government, in order to achieve the desired targets in serving the people, especially the Minister of Interior who is now trying to re-build the trust with the people of Egypt. People to find their needs of food and health care. Wisdom for the youth, in order not to allow the extremists to stir them up. The families who lost their loved ones in the violence, and those who are injured. Our beloved Egypt to recover this turmoil. Once again, thank you so much for your prayers and words of encouragement. Thank you for your continuous prayers, emails and phone calls. We value and appreciate this. I am sorry to tell you that things did not go well yesterday evening. The morning gave us hope as demonstrators started to leave Tahrir Square. However, in the evening things changed 180 degrees when the crowds who support President Mubarak arrived to Tahrir Square and both the supporters and demonstrators clashed with each other. Fires due to Molotov cocktails and stones were used in these clashes. Three people were killed and over six hundred people were injured. Today the Government started dialogue with the opposition and we hope and pray that things will calm down. I called upon the people of Egypt to give time for the new government to achieve the needed security, justice and democracy. We meet everyday at the Cathedral to pray for the situation. We thank God because all our churches and institutions are safe. We with many other Egyptians are very sad because of the violence and destruction within our beloved country Egypt. Egypt is known in the region to be "the mother of the world." Now, the mother is wounded by its own children, which is harder than wounds of outside wars. Please pray so that God may give wisdom to all those who are in authority to put an end to this unacceptable violence. Pray for the demonstrators in order that they may go back to their homes and wait for the new government to act. Pray for the medical teams who are dealing with the wounded. Pray especially tomorrow as people tend to gather and demonstrate on Fridays. Last Friday was very bad, as you know. Pray for God's protection for all the people of Egypt. We have hope in God who is the King of Kings and Lord of Lords. The Most Rev. 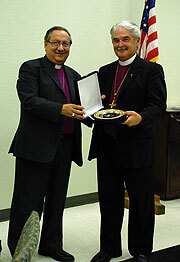 Dr. Mouneer Anis is the Anglican Primate of Jerusalem and the Middle East. The Archbishop was our guest in the Diocese this past September in his role as a Board member of the Anglican Relief and Development Fund.